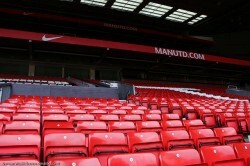 Earlier in the summer, United fans received an email or a letter from the club, asking the fans to show they were “100% committed” and renew their season tickets or memberships. I’m not too sure about the fans’ commitment but, after last night’s scandalous prices, we can safely say that the club is “100% committed”. Committed to rip us off. Despite the League Cup being – understandably – the last of United’s priorities this season, which means that fans get treated to a combination of first team’s fringe players and a few young lads from the Reserves, United still charged full price last night, with the cheapest ticket at £30, the most expensive worth £52 (!) and an average price of around £40. Considering the prices and the occasion, a crowd of 46,358 isn’t perhaps as disappointing as it would have normally been considered, but it was the perfect opportunity to bring back some of the many fans that have felt alienated from the club for a few years and it was sadly and regrettably missed. Arsenal, who will charge £62 against Chelsea on Saturday, had tickets for £20 in the upper tier and £10 in the other areas of the ground, with kids’ tickets available for as little as £5. Chelsea charged £25, City £22.50, with kids charged £5 and 16 to 21-year-olds £15 (even, though, true to their tradition, only 18,500 turned up to support the ONLY team in Manchester). At Old Trafford last night, kids were charged £12, and 16 to 21-year-olds could get a ticket for £22 a pop and if clubs with stadiums considerably smaller than Old Trafford can afford to have tickets on sale for £10, why can’t we? For a club so focused on delivering a strong brand image and who targets the market so aggressively, last night’s effort was really, really poor in terms of PR. simple maths and wanton greed are the answers. 46k paying £40 (average) = £1.8m ish. though they saw a pretty decent game for their money, i’m inclined to say more fool those who’ll gladly stump up such ridiculous sums anymore. and shame on the club for exploiting fans’ *addiction* in such a brazen manner. Ain’t that the truth! I am %100 committed.Committed to removing that collection of inbred redneck vermin that now “own” this club. That’s the downside of having one of the largest world-class grounds in Europe. Running costs of the stadium are much more so the expenses have to be spread to the fans. People have always been whining about expensive tickets since 1994. The attendance against Villa was 28015, but why let the facts get in the way of a good lie eh? You had 30k empty seats, despite each and every one of your season ticket holders being forced into buying tickets for cup games whether they want them or not, so kudos to your lot, once again you’ve outdone liddle ciddy. @Fifthcolumnblue: Not true you can opt out of league cup matches. Go back to your hole. Another example of the blatant bleeding of this club and its fans.